Two community-minded business ventures have found a new home in the former Cinnamon Jim’s building in Brussels; a café called Mitch and Mama’s Café and the Homegrown Food Bank project. Right now, Charity Hilson, aka “Mama”, and Jef MacPherson and Dave Scherpenzeel of the Homegrown Land Bank, the parent company behind the food bank project, are working on preparing the former Cinnamon Jim’s store to offer both a new café as well as a place for the Homegrown Food Basket, offering a bricks-and-mortar storefront after previously operating strictly online. While new to the Brussels area, both businesses are established, with Mitch and Mama’s Café having opened inside a Listowel store in 2017, then moving to a church that had been the home of Theatre 311, before deciding the space didn’t fit the company’s needs. At some point after that, Hilson was having lunch at JR’s restaurant in Brussels and spied the former Cinnamon Jim’s, a unique building for sure, she said. Hilson said that knowing Jackie DeWit, who recently opened a number of business ventures in the community, and witnessing the construction and success of the Four Winds Barn, the community was an attractive place to move her family’s business. She also said the community was very welcoming. Hilson then purchased the Cinnamon Jim’s building and connected with MacPherson and Scherpenzeel to run the two businesses in concert. The building will, after some significant renovations, be home to the new café and the side room, to the south of the former Cinnamon Jim’s Café will be home to the Homegrown Food Basket operation, Hilson explained. The site will be home to the products that go into the Homegrown Food Basket, alongside several other lines, including goods from Millbank’s famous Anna Mae’s bakery and restaurant. The site will be serving Coastal Coffee from Zurich, which has become a popular choice for local restaurants and coffee shops. The second floor of the building, formerly known as The Upper Deck, will also be renovated, Hilson said, saying there will be some great surprises for the community up there. “We plan to keep events going up there, but how that’s going to work, we haven’t figured out,” she said. Hilson started Mitch and Mama’s Café to help her son, Mitch, find gainful employment. Mitch has been diagnosed with Williams Syndrome, a developmental disorder that impacts learning ability and causes distinct physical markers. Hilson has worked with individuals with developmental issues for nearly two decades and felt this was an opportunity to allow Mitch to have a career and connect with people. 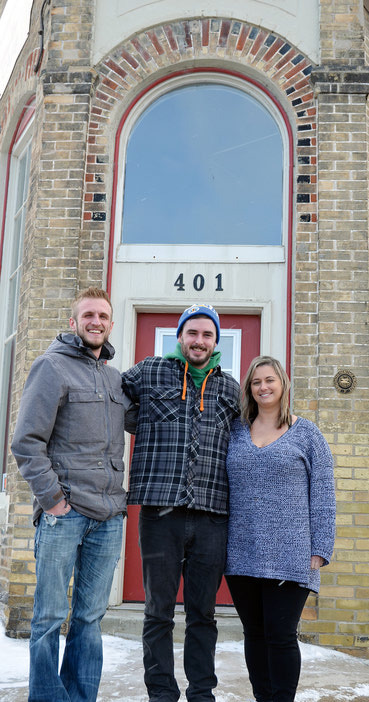 The original goal of the company was to create an inclusive space in Listowel, while, at the same time, creating an opportunity for Mitch and others like him. The café has been the focus of several media stories since opening two years ago. Scherpenzeel, the co-founder, co-president and secretary of Homegrown Land Bank, said that the food baskets for the project will be distributed out of the site, and goods will be available there as well as online. “We’ve had several farmers contact us regarding having their produce here, and even had people looking for jobs,” Scherpenzeel said. Homegrown Food Basket, which has been marketed as an online farmers’ market, is a unique business project within itself, but MacPherson and Scherpenzeel have used it to help fund the Homegrown Land Bank Group. The two ventures allow MacPherson and Scherpenzeel to encourage and provide loans for farms both at home and abroad, encouraging financial sustainability for a new generation of farmers around the world. The land bank group was recently featured at Huron County’s Meaningful Market event in Brussels, where MacPherson and Scherpenzeel presented it as part of a Dragons’ Den-style pitch competition. Watch The Citizen for updates, including a yet-to-be-determined opening date. For more information visit mitchandmamas.com for the coffee shop, and homegrownlandbankgroup.com or homegrownfoodbasket.com for information on those ventures.